Dr Shamsul Haque presenting on stereotypical thoughts. In the third instalment of the PechaKucha for 2015, three academics presented interesting findings and provoked an active discussion on issues that affect us. Living with fear, suspicion and hatred? Associate Professor Shamsul Haque from the Jeffrey Cheah School of Medicine and Health Sciences touched on these matters based on his student’s findings in southeastern Bangladesh. The study examined stereotypical thoughts and perceptions held by 12 ethnic groups in the Chittagong Hill Tracts. Interviews with high-prejudice participants revealed perceptions such as dehumanisation, disapproving contact, confirmation bias, and reciprocal harming. Low-prejudice participants, on the other hand, were more likely to perceive that members of the other community possessed positive qualities. However, according to Dr Shamsul, rumour susceptibility and blaming the government as biased were equally observed in all the participants. Professor Mahendhiran Nair presenting on innovation ecosystems. 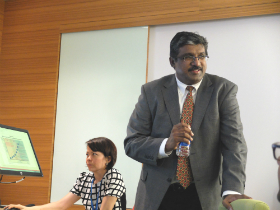 On “Innovation Ecosystems and Sustainable Economic Development”, Professor Mahendhiran Nair said that many innovations have emerged over the past 10 years to address challenges for developing countries and under-developed countries. Malaysia, for example, has gained strength in certain sectors, he said. When questioned about the New Economic Policy (NEP), Prof Mahendhiran agreed that the philosophy behind the policy was good but suggested that its implementation could be improved. On graduate employability, he stated that employers prefered ‘ambidextrous’ workers who had broad-based knowledge and could think laterally, and that universities would need to produce graduates who can work in multidisciplinary areas. Third speaker, Professor Sunil K. Lal from the School of Science, claimed we carry 100 times more microbial cells than normal cells and that a majority of microbes are good for us and required for survival. He encouraged the intake of probiotics and to decrease the consumption of antibiotics. “The Human Microbiome Project (HMP) studies complex behaviours of microbes that interact within us and are essential for our everyday survival,” Prof Sunil stated. Professor Sunil K. Lal presenting on microbe cloud. He added that many people who are germophobic tend to destroy the microorganisms surrounding them, causing various chronic conditions. “Don’t destroy relentlessly our own microbial cells. Architects and biologists need to sit together and talk when a building is being constructed. Wherever we go, our microbial cloud goes with us. We are them, and they are us,” he said as a take-home message. PechaKucha is held once a month, featuring three to four speakers each time. PechaKucha - which means ‘chit chat’ in Japanese - is a series of lunchtime talks organised by the Professors Advisory Group (PAG). 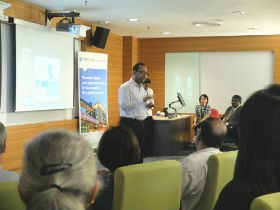 The concise and fast-paced talks introduces the audience to a range of disciplinary areas covered by Monash Malaysia’s academics.